During the winter months in Minnesota they have a PIP meter (pain in the posterior) that measures all nature of weather related suffering. I think it’s time that we in the southern climes come up with similar yardstick for summer. Something like: the number of consecutive days that the thermometer reaches above 90° and the humidity levels never dip below 80%. Or how fast does makeup melt off of your face? As I write this at 4:30 p.m. , the temperature is 91° with the feels like at 102°. Suffocatingly hot and sticky. This is no time to cook! And with this easy chilled cucumber soup, there’s no need to turn on the stove at all! With this simple combination of English cucumbers, fresh cilantro, silken tofu with a little vegetable broth, you’ll have a delicious, refreshing, healthy, homemade soup in minutes! Blend until smooth and chill for a few hours, so it’s nice and cold. The tofu gives the soup body and froth and I love that pale green color, don’t you? For a little contrast, I make a quick pico de gallo with ripe tomato, finely diced white onion and cilantro. 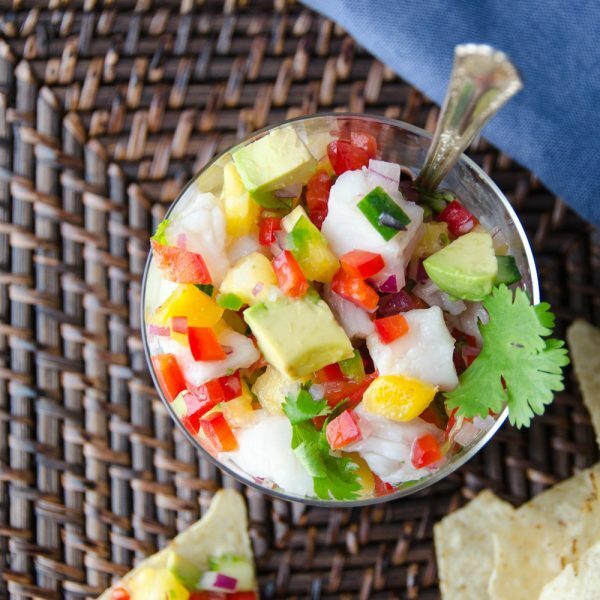 For just a bit of acidity, squeeze half a lime over the pico de gallo and give it a quick stir. When you remove the soup from the refrigerator, check to see that it hasn’t separated. If it has, make sure the lid is firmly on your container and give it a good shake to reblend – or run it through the blender again. Ladle the soup into bowls and gingerly float a scoop of pico on the surface. This makes a delicious starter for a summer meal and it’s super-healthy too! Want more cold soups? Try this chunky gazpacho, and creamy chilled vidalia onion soup. On a hot summer day, noone wants to cook. You don't have to with this light, refreshing chilled cucumber soup! A delicious, quick starter to any al fresco meal! In a blender, combine all ingredients for the soup. Puree until smooth. Refrigerate at least two hours to chill before serving. Season to taste. In a small bowl combine tomato, onion, jalapeño, lime juice and olive oil. Toss to combine. Taste for seasoning and add salt accordingly. Chill two hours before serving for flavors to develop. To serve, ladle cold soup into chilled bowls. Float one or two slices of cucumber on the soup and carefully spoon pico de gallo over the soup and sliced cucumber. Be careful so that the garnish doesn't plop to the bottom, but rests gently on top. Enjoy! You can substitute regular kirby cucumbers, just be sure to remove the seeds. The seeds are negligible in the hot house variety, so I skip that step. I have dietary restrictions on soy. Any ideas for subbing the tofu? Would Greek yogurt work? I have made cucumber lemonade before, never thought of making a soup out of it! This recipe is very interesting..love the idea of adding tofu to it. Gives it a good mix of proteins and the soup sounds refreshing as is! It’s very light and refreshing — a delicious starter to a bigger meal! Why do I not tend to make chilled soups at home? It’s so hot here in FL and enjoy them when eating out! This looks delicious! Can’t wait to try it! You need this all summer long if it’s going to be 80% + humidity and 90+ degrees days! That’s intense! I know I would love this soup bc I love gazpacho and made an avocado gazpacho last year! Love the addition of silken tofu. This is my favourite soup to make during the summer and I like to sprinkle some feta on it too. The feta sounds delicious! I love hearing how everyone personalizes recipes to make them their own! Such a refreshing recipe and perfect for the weather. I have never tried tofu may be I can give it a try 🙂 Wonderful clicks btw! You don’t taste the tofu in this recipe, it just adds body. Thank you swayam! I think spiced grilled shrimp would be excellent on top as well! It is great for those hot summer days, Jagruti! This will be perfect where I grew up, Philippines during the really hot and humid summer days. I wilt in the heat! So I rely on cold stuff like this to get me through summer. Sounds refreshing and delightful! I wilt too — consequently, cold soups, icy drinks and frozen pops are the only way to summer! Thank you Edyta! The tofu adds a great silk mouthfeel, I think! I love that there’s tofu in there! And I’m a big fan of pico de gallo. Pinning this for when my PIP meter needs to go down a few notches. READ: often. Glad you like it, Christine! My taste testers loved this one, too!